Lock in a great price for La Posada Copan – rated 8.3 by recent guests! La cama es comoda. Velocidad de internet es buena. Fácil acceso a estacionamiento. Ubicación muy céntrica en el pueblo de Copán, habitaciones espaciosas y cómodas, y personal amable con la comodidad de poder pagar la estancia con tarjeta de crédito. El wifi funciona correctamente. Cama super comoda,higienico, excelente atención.Volveria nuevamente!! Located in Copán Ruinas, La Posada Copan offers a garden. The property provides a 24-hour front desk and free WiFi is available. At the hotel, all rooms have a desk. 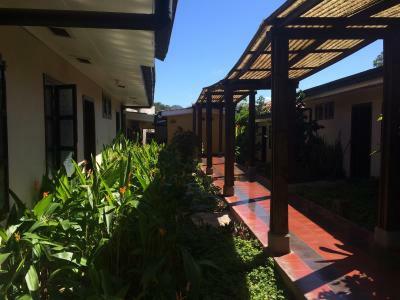 Featuring a private bathroom with a shower and free toiletries, certain accommodations at La Posada Copan also provide guests with a balcony. At the accommodation every room includes a closet and a TV. When would you like to stay at La Posada Copan? House Rules La Posada Copan takes special requests – add in the next step! La Posada Copan accepts these cards and reserves the right to temporarily hold an amount prior to arrival. I used the credit card for payment. But it was charged double! If you use the credit card , you should check the bill of credit card. location. water is free of charge.